Rainforest Waterfalls, an family outing place in Tawau District with a mini hydro plant. The Rainforest Waterfalls located at Andrassy, 28km from Tawau town on the way to Tawau Air Port. The resort is the brainchild of former Tawau Member of Parliament, State Assemblyman and Senator Datuk Geoffrey Yee, in fulfillment of his dream to own a waterfall. Ranggu Water Fall features landscape sculptures in alluring natural surroundings. The area has three main waterfalls, each having its own uniqueness. 1) The first fall which greets everyone on arrival offers a natural mural which changes according to sunlight and amount of water falling over it. Some call it the magical wall. Visitors may take a refreshing dip in the cold water, dive relax at the nearby resting areas to appreciate beautiful scenery. 2) The second fall is accessible by climbing a flight of challenging steps around a giant tree. Sitting here is like relaxing at a pavilion while enjoying the fresh water wetting and cooling the body. 3) Further up stream is yet another fall which is shallower but no less attractive. There are basic facilities provided, such as bathrooms, toilets, barbecue stoves, resting areas with ample water supply and hydro electricity supply. Hand-made sculptures are strategically placed to add to the appeal of the waterfalls. Nature lovers may also like to stay overnight to enjoy the sound water and what nature has to offer. 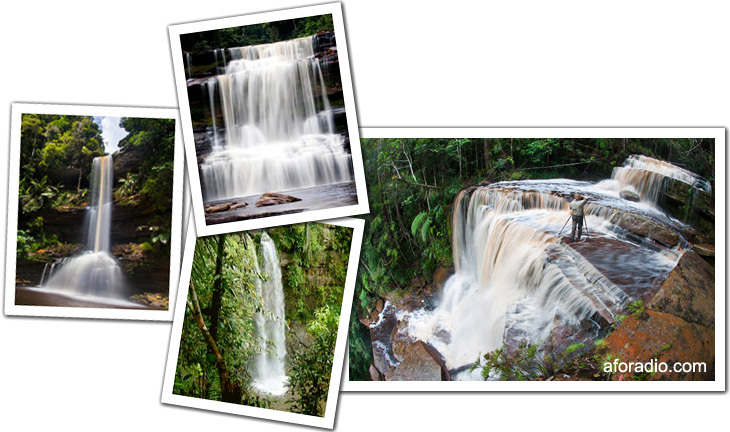 The Rainforest Waterfalls is certainly a great place for picnic, camping, hash runs or group activities. The Rainforest Waterfalls is open daily. You may drive there through Jalan Ranggu or Jalan Quinn Hill, off Jalan Apas. Entrance fee is price at RM8 for adult and RM3 for children.